The Legend of Zelda: Majora’s Mask is my absolute favorite title in the long-running franchise, but even I have to admit that the game’s conveyance could be a little… obtuse at times. Aside from saving the land of Termina from a falling moon, players would also have the opportunity to help many of the game’s NPCs with various problems, often being rewarded with rupees, heart pieces or a much-coveted mask. 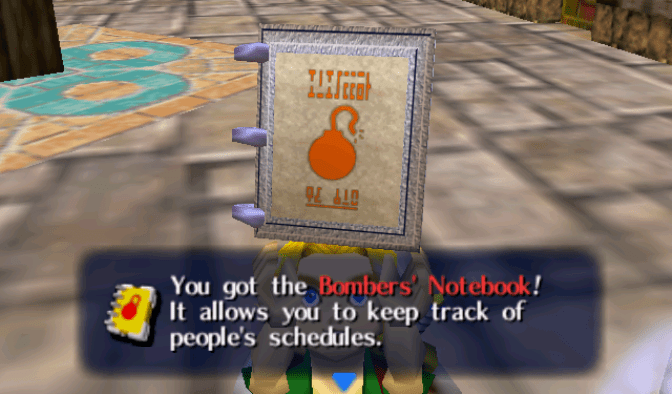 To help keep track of all this, players could receive a special item known as the Bombers’ Notebook to help them keep track of the schedules of those conflicted folks. Unfortunately, even then, it could still be hard to follow everything that needed to be done (Kafei/Anju quest, anyone?) — particularly un-inquisitive players might even play through the entire game missing this crucial item. We were told by Mr. Miyamoto that he felt there were a lot of users who finished the original without even noticing all the hidden events scattered around the town. He said that he wanted us to make sure users were more aware of them this time around. I can think of at least a few sections in the game that would benefit from a little more guidance. How about knowing to help the Deku Butler to get the Mask of Scents? Or what about knowing how to get your sword fully upgraded with Gold Dust without the use of some kind of guide? I don’t think I even knew about the Beaver Brothers in the Great Bay until years after the game’s release. Are these the kinds of things that should be included in the Bombers’ Notebook, or do you think the extra hand-holding would go against the game’s spirit of exploration? Let us know in the comments. The game is slated for release this Spring.